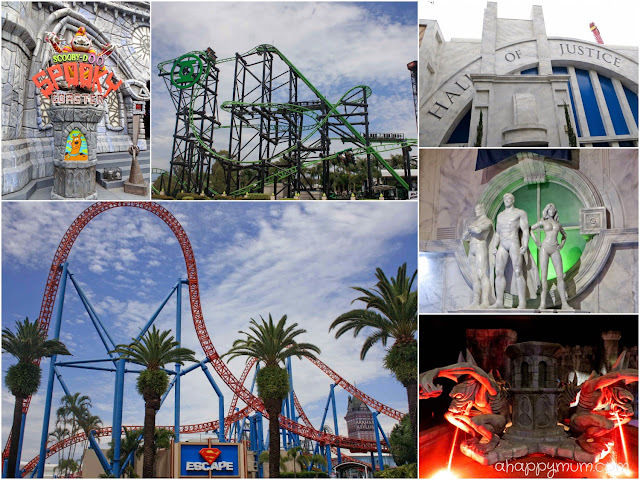 A trip to Gold Coast is never complete without visiting the renowned theme parks. 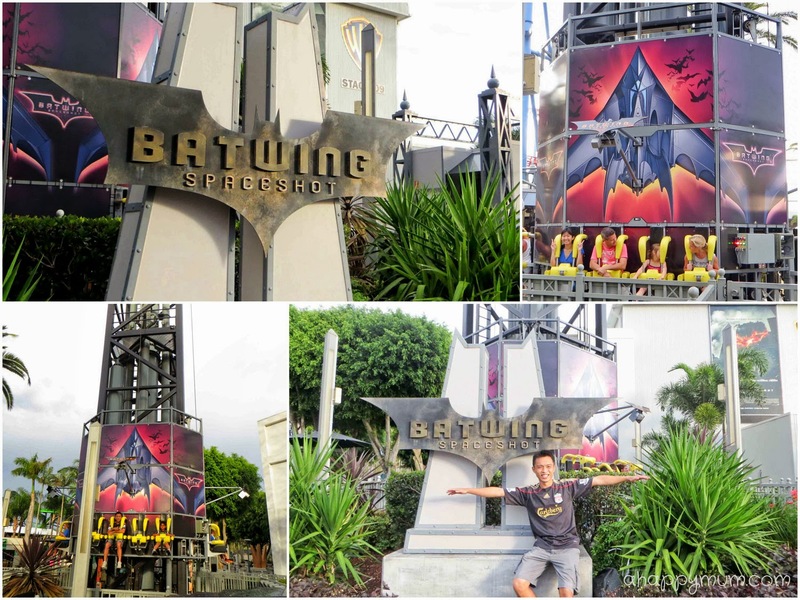 I remember back on my graduation trip, my friends and I enjoyed the thrills as we screamed our hearts out at Dreamworld. 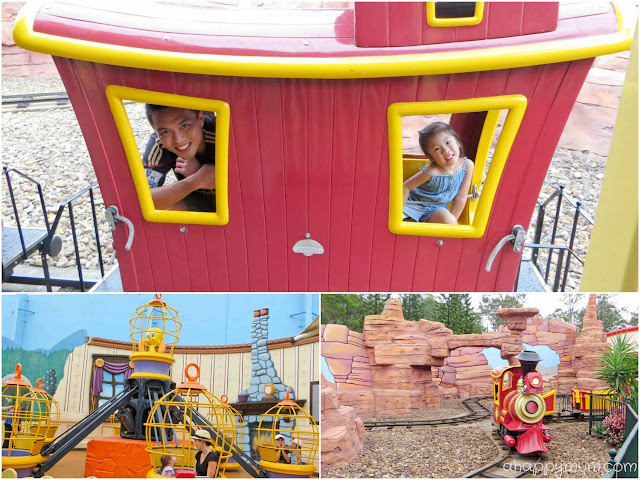 This time, it was more about carousels, mild rides and family fun. But, the hubby and I did sneak out one at a time just to experience that adrenalin rush once more. 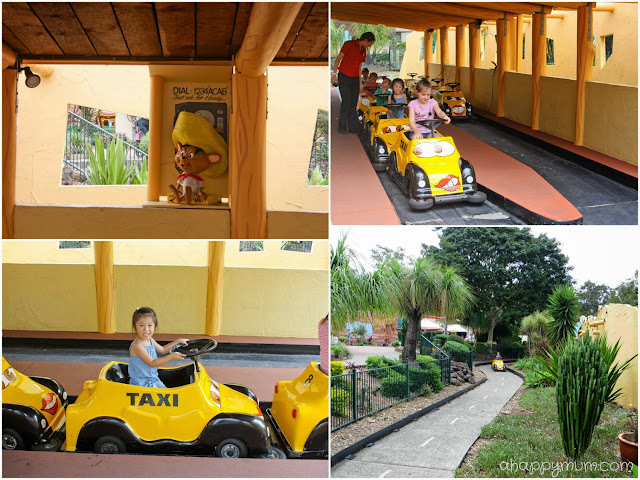 Join us on our adventures as I show you the different theme parks we visited and all the fun we had as a family. 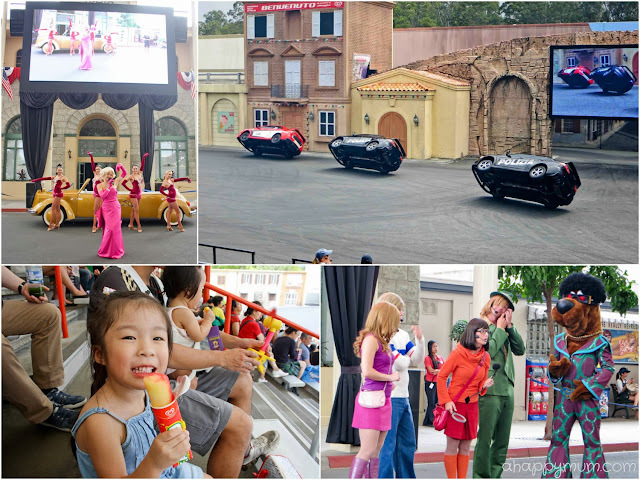 Opened in 1991, Warner Bros. Movie World is the only movie related theme park in Australia. 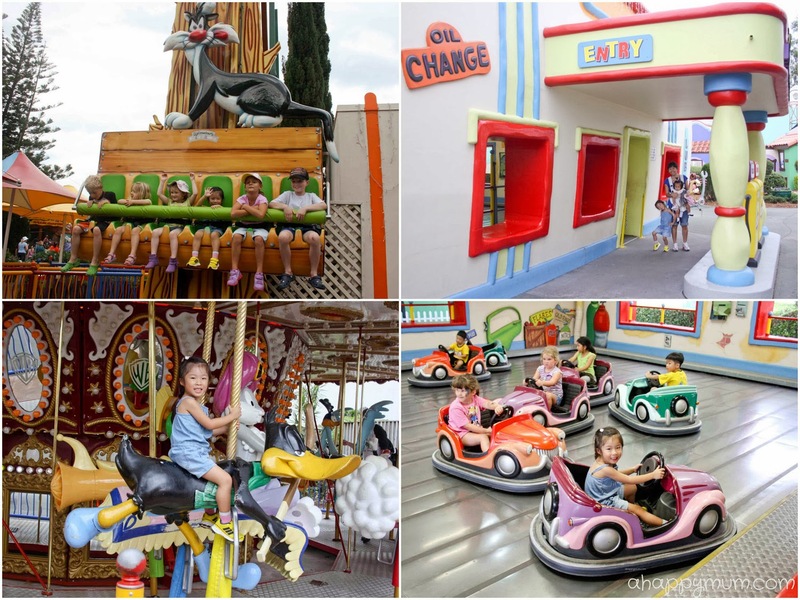 The park can be divided into four broad sections: Main Street, Kids' WB Fun Zone, Wild West area and DC Comics superhero hub. I like that there is something in Movie World for everyone - the thrill rides, the kiddy attractions, the entertainment shows, the live performances. We spent a good part of our day in Kids' WB Fun Zone, a themed area based on the Looney Tunes cartoon, since not surprisingly, that was Angel's favourite. 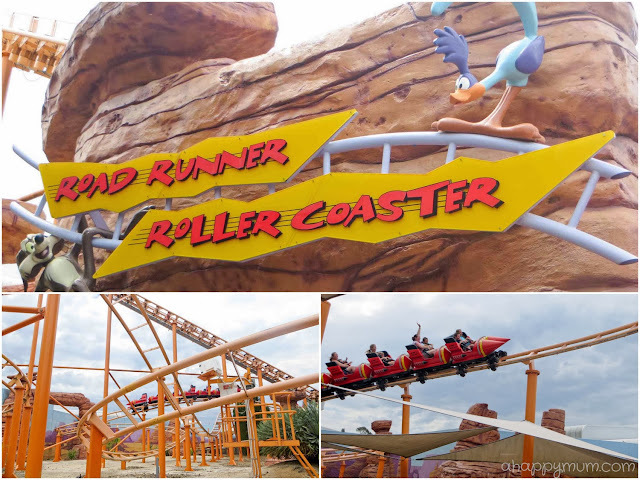 She was delighted with all, or most, of the rides here where she got to bounce with Sylvester, drive a Speedy Gonzales Tijuana Taxi, ride on Daffy Duck, go into Tweety Bird's cage and ride on the Road Runner Roller Coaster. It was also the first time she did a bumper car ride, alone. A mini bumper car, of course. She was a careful driver, not one who likes to crash into others, so she just happily drove around while waiting for others to bump into her and then she would squeal with delight. This girl is growing up fast, isn't she? Talking about the roller coaster, by the way my girl digs this kind of ride and would always try to sit in the front row, we went on it once and she found it so fun that we decided to go on it again. Alas, on our second attempt, the crew member came to measure her height and deemed her as 0.5cm too short to ride since the minimum height required was 100cm. I kindly explained we just did the ride (he was the one who let us through, anyway) and my girl loved it, so could we do it again, please? Neh. He told us to please exit. Bummer. 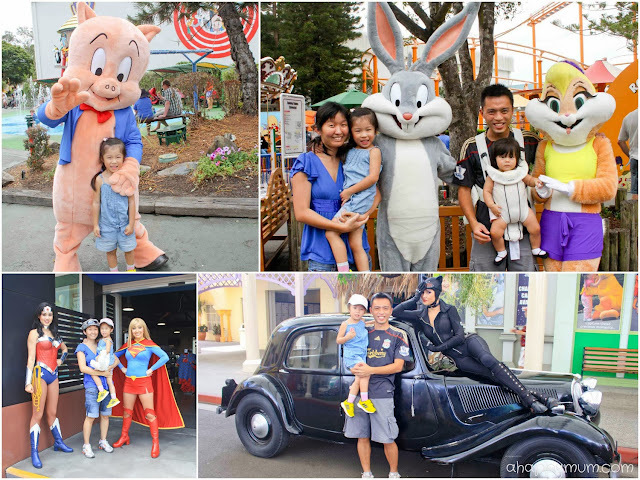 What's a visit to a theme park without taking pictures with all the cuddly mascots and costumed characters? 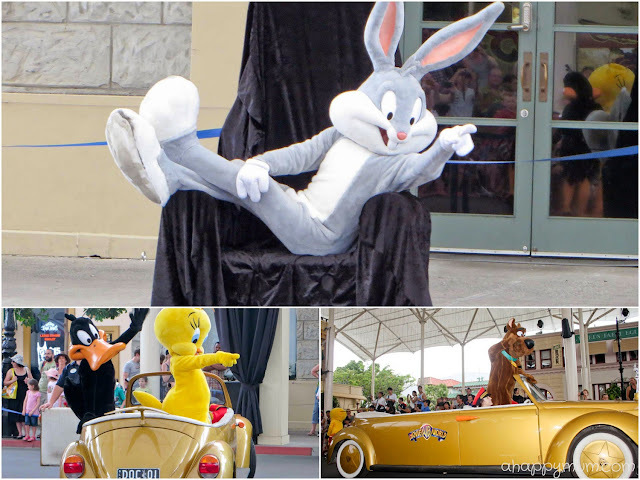 We would go ecstatic whenever we spotted one and then shout "It's Bugs Bunny! ", "The Pig, there's the Pig! ", "Scooby Dooooo! ", "Catwoman? Ok, hubby you go take with her", "What, no Batman in sight?". At 30 years old, it still thrills me to see mascots and to do high fives with them. Childish? Wait till you see me do that at 50. Or even 60. Besides the rides, visitors at Move World are also treated to Main Street live shows including Marilyn Monroe dance act, Scooby Doo skit and so on. The hubby's favourite was the Hollywood Stunt Driver where guests are put in the middle of an action movie set and the show features gun shots, explosions and car chases. For me, I preferred the Ice Age: Dawn of the Dinosaurs 4D experience. 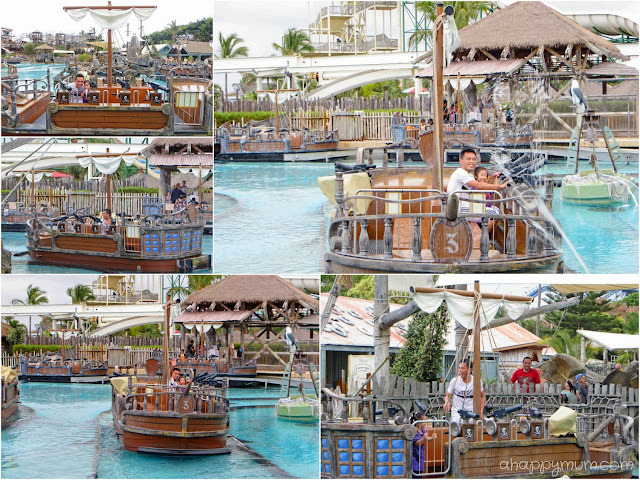 Even though I had Ariel on my lap and was only allowed to sit on a stationary seat, it was yet another experience to watch the people in front, including the hubby and Angel, bounce up and down, jerk left and right, or get squirted by water. 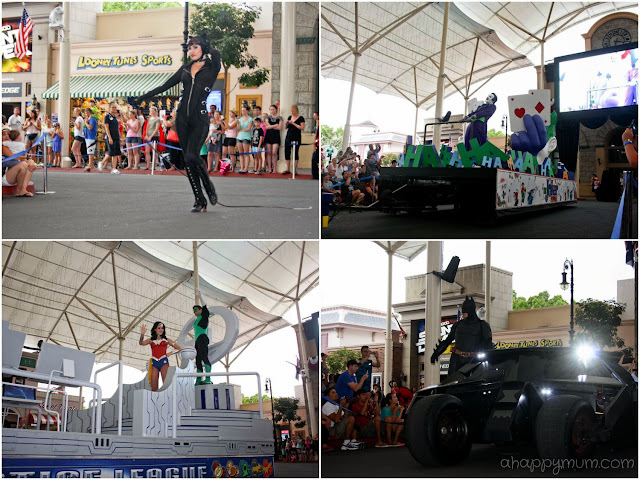 The All Star Parade is not to be missed because that is the only time you get to come up close with all your favourite characters alongside vehicles and movie-themed floats. They even had the Batmobile! Angel was hoping to meet Tweety Bird and though we didn't bump into it at the park, it was here at the Parade that Angel got to shake hands with the bird and when it gave her a pat on the head, that moment, she just beamed like the happiest kid. We saw these dogtag machines at the park and the hubby decided to do one for each of the girls. Except for getting Ariel's birth cert number wrong, which he happily printed before asking me, well, at least he passed and got their full names, dates of birth and countries of birth right. 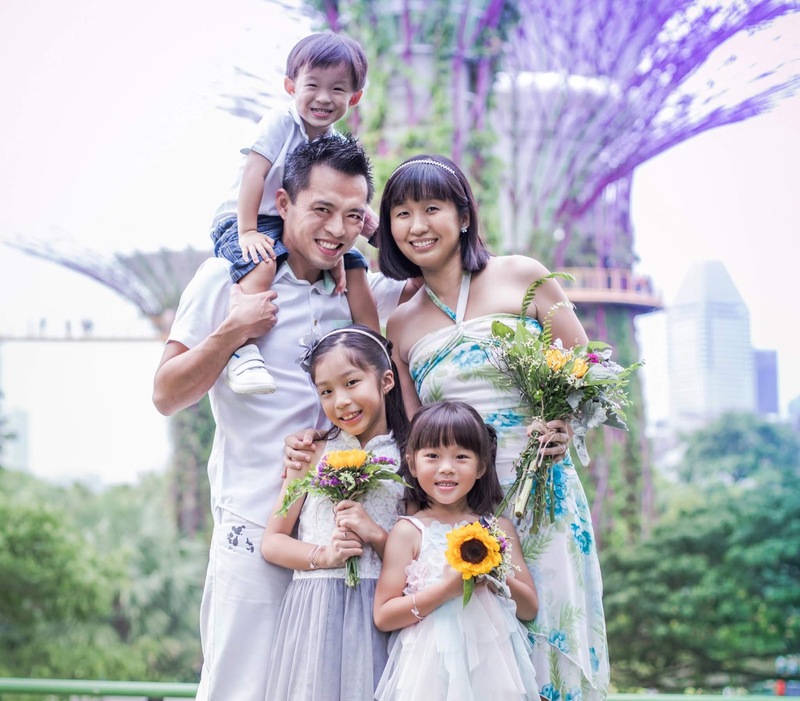 Does your hubby know your child's birth cert number? 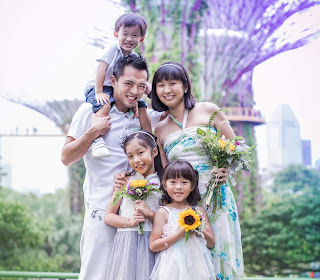 One thing you should know, all the theme parks here open at 10am and close at 5pm, which doesn't give you that much time to play when you have a tendency to sleep in, when you have kids who need food and afternoon naps, when you like to take things easy on a holiday. You do need to arrive earlier if you want ample time to explore. Before we called it a day, the hubby and I decided to challenge ourselves and go on the thrill rides. We both loved the Scooby Doo Spooky Coaster which is an enclosed steel wild mouse roller coaster in the dark. It features 530 metres of track, highest point is 17 metres which is reached through a lift, largest drop is 7 metres and done in reverse. I loved every bit of the suspense! I also tried out the newest ride - Justice League 3D – The Ride, an epic interactive ride where you join Superman, Batman and an army of Super Heroes in a battle against the evil. With your laser blaster, of course. When it was the hubby's turn to choose a ride, he decided to go on Batman Spaceshot, a pneumatic powered ride which shoots riders up and then back down. 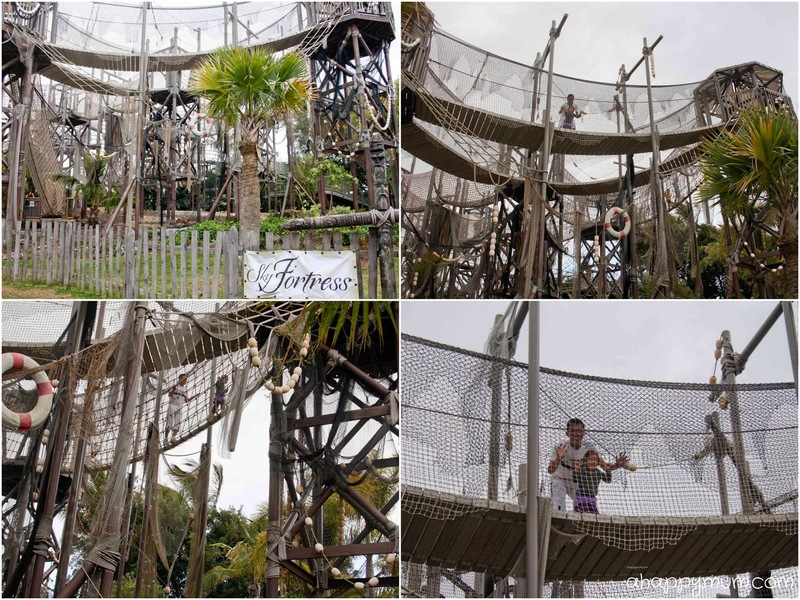 The rise reaches a height of 61 metres and riders experience a force of up to 4Gs while travelling at a speed of 64 kilometres per hour. Too complex? Ok, it was fast and high. Wayyyy fast. How did I know? Because the hubby dared me to try after he was done and not to appear like a weakling, I was of course game enough to step up. It didn't matter that I shrieked like a mad woman (didn't you hear me all the way from here) or that I couldn't feel my legs. The fact was that I DID IT. Yayyy. "Th-th-th-that's all folks!" for Movie World. Now, where do we go from here? Sea World is a marine mammal park, oceanarium, and theme park and includes rides, animal exhibits, shows and other attractions. 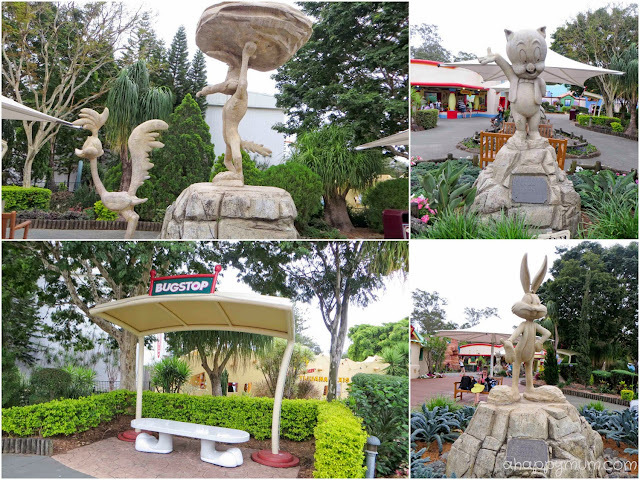 We had expected it to be more or less the same size as Movie World but it was much larger and therefore we had to be more selective and planned our route according to the showtimes and areas which we wanted to visit. 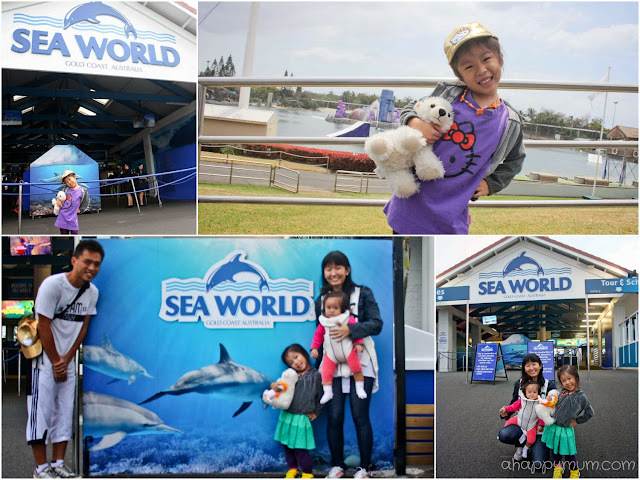 The highlight of Sea World for Angel was meeting who else but her favourite character. Thanks to a partnership with Nicklelodeon since Christmas 2011, guests at Sea World can now get to come up close with SpongeBob SquarePants and Dora the Explorer. We don't know much about the Sponge but this Latina explorer with her purple backpack, my girl is insanely in love with. 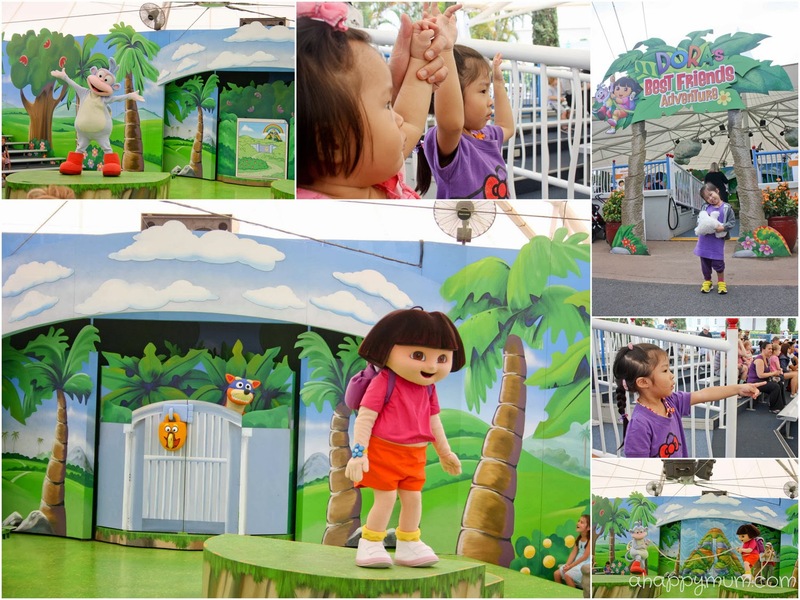 Watching the live show at Sea World was what inspired me to have a Dora birthday party for her too! When it was time to meet and greet, we did it not once, but twice. Yes, we queued twice! 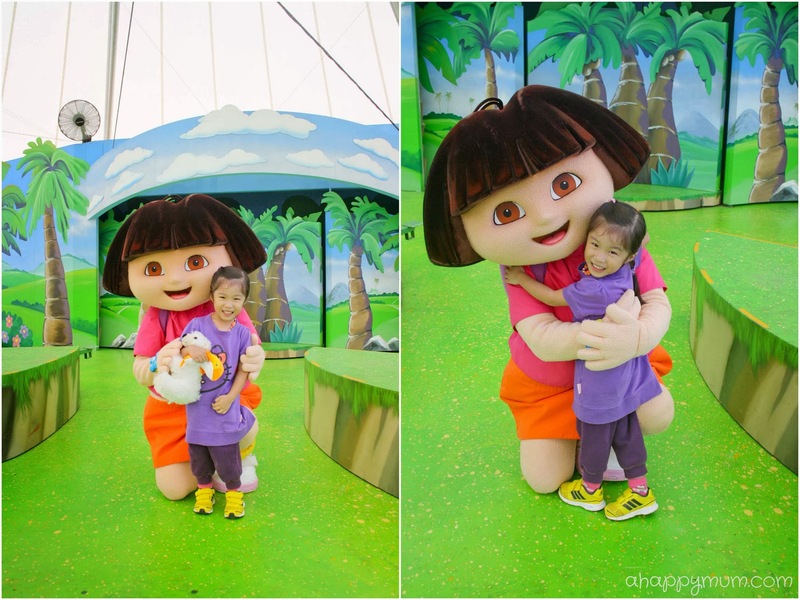 The second time round, Angel remembered to give Dora a big, tight bear hug. 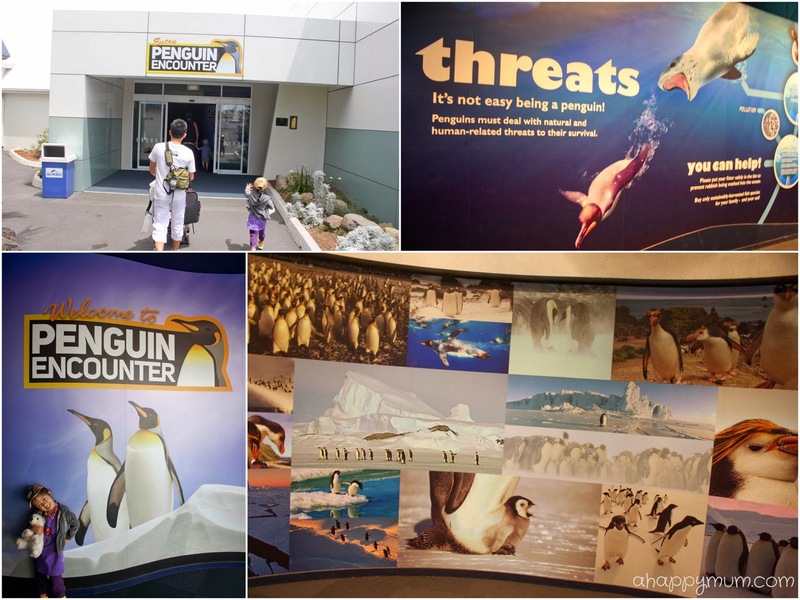 The park has various marine attractions and one of it is the Penguin Encounter - a 96-square-metre Antarctic penguin exhibit featuring a 220 cubic metres pool with under and above water viewing. 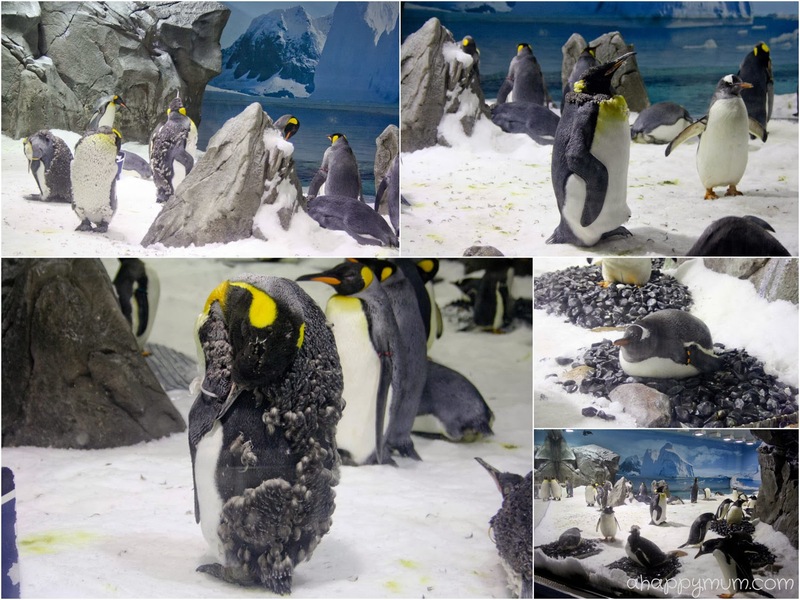 We saw Gentoo and King penguins and interestingly, it was during the molting season so you could witness some of them shedding their fur. 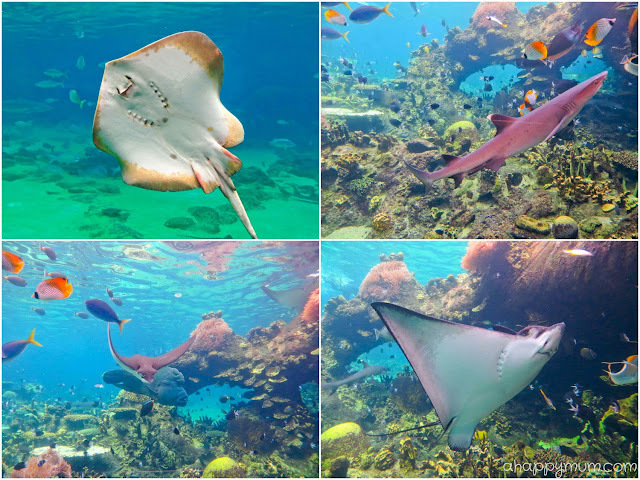 Ray Reef consists of a large lagoon pool and a smaller pool which together are home to more than 100 rays, who were friendly to the visitors because they kept swimming up to the sides to let us feel and touch them. Ok, they probably thought we had food but we didn't. Angel was so thrilled every time she felt the smooth skin! 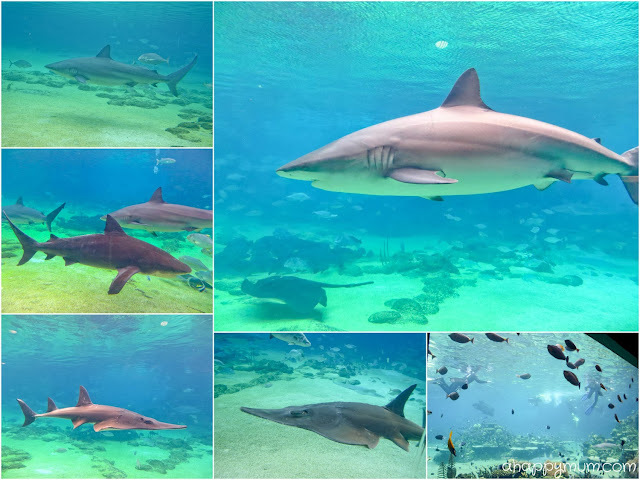 Next up is Shark Bay - the world's largest man-made lagoon system for sharks. 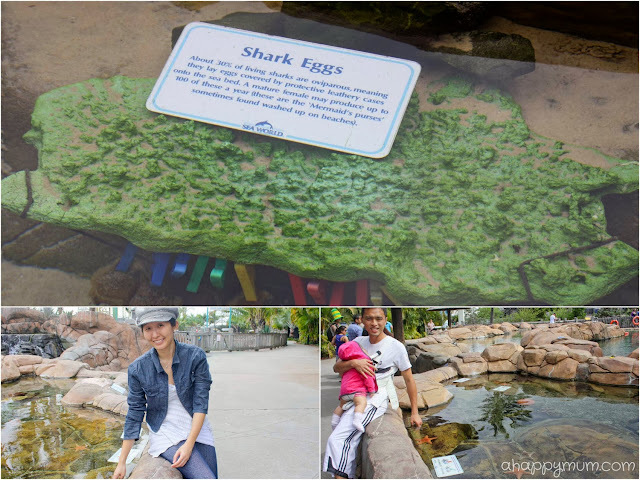 The exhibit consists of four areas allowing for guest viewing and interaction - including a touch pool, an inter-tidal zone, a reef lagoon and a shark lagoon that houses some of the world's largest, most feared and potentially dangerous sharks. There were four 10-by-3-metre viewing windows which gave us a clear view into the fascinating underwater world. You know, we could easily spend up to hours here because the hubby is such an aquarium lover and he loves to point out every fish and explain to us about its features and behaviour. Not that I can remember, but it is always interesting to listen. Our most loved show in the park was Imagine - latest incarnation of Sea World's dolphin show. Set in Dolphin Cove, the largest sandy bottom lagoon ever built for dolphins, this show promises to blow you away. I've always found dolphins to be one of the most fascinating, beautiful and graceful marine mammals and to see them doing somersaults in the air, that was truly awe-inspiring. 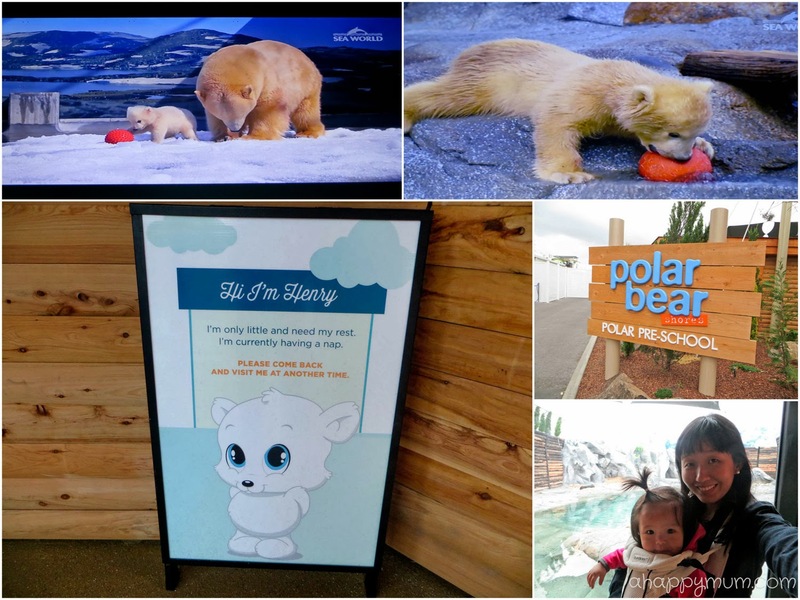 Polar Bear Shores is Australia's only Polar Bear exhibit and houses four polar bears as of 2013. 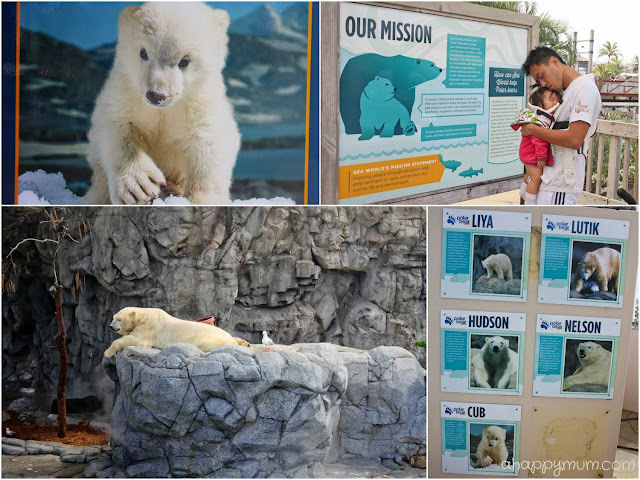 We were hoping to see little Henry who was born in May this year, took his first steps in July and went on public exhibit in September. Alas he was sleeping when we first arrived but not to be daunted, I came back a second, then a third time. Did I see the cub in the end? Yes, I did! For two seconds. Before he decided to hide from us and didn't reappear again, despite that Ariel and I continued waiting for over half an hour. Oh well. Better than nothing, right? One of Angel's most loved areas in Sea World was Beach Break Bay - a themed children's area with six attractions. 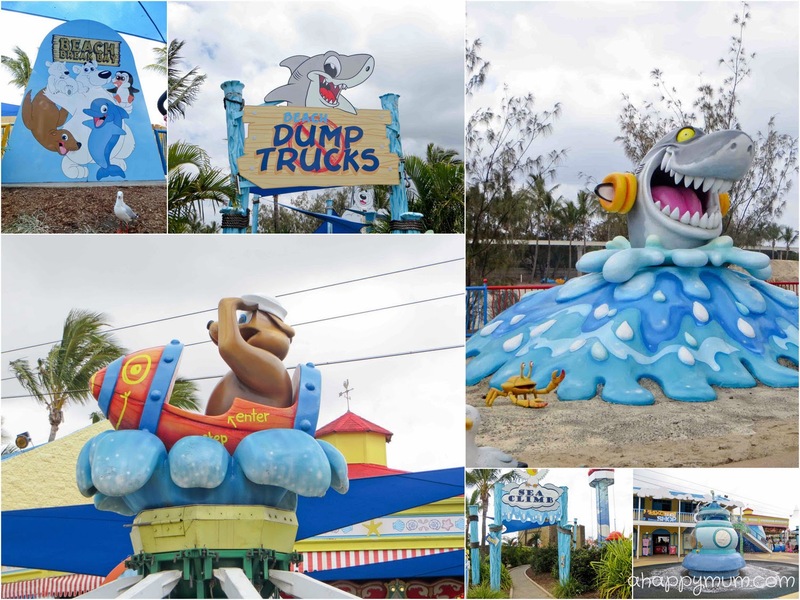 I personally loved the Beach Dump Truck ride where Angel got to drive a truck carrying me and Ariel, we could even sound the air horns! Our last stop of the day was Castaway Bay - a children's area featuring Sky Fortress (a climbing structure), Sky Climb (a set of high ropes) and Battle Boats (an interactive water battle). For some reason, the hubby decided to take Angel on the Battle Boats ride even though he knew jolly well that he would be wet, it was not particularly sunny and he had no change of clothes. I watched in fascination as he 'fought' against other fun-loving visitors who were lying in ambush and squirted at them non-stop, before I finally found a gun and joined in the splashing fun. That's him, my spontaneous hubby. 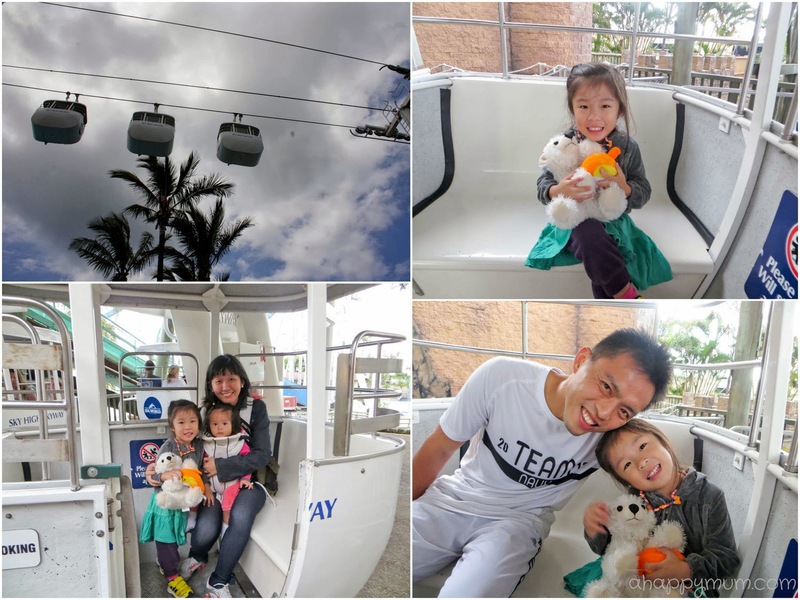 We were lucky to be the last passengers to board the Sea World Monorail, Australia's first monorail system, back to the main entrance where we bade farewell to this place that felt like a dream come true. 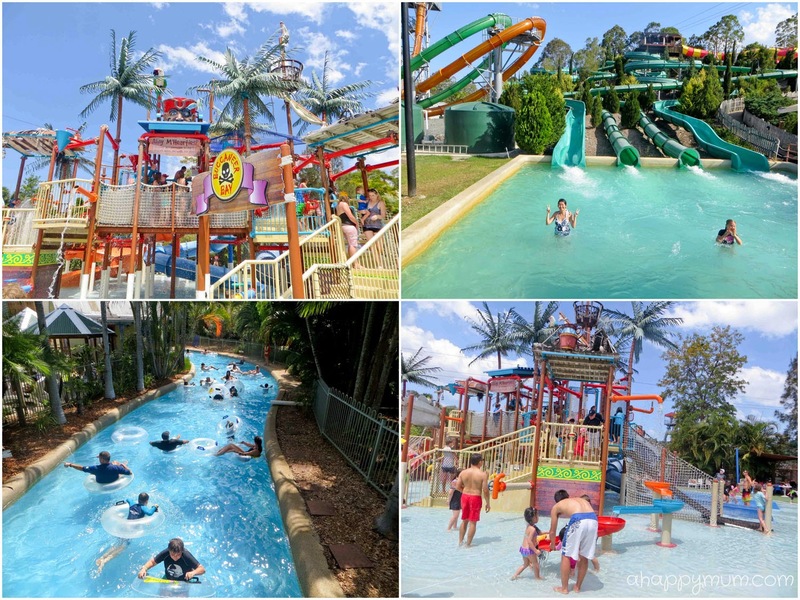 Wet 'n' Wild is a huge water park located adjacent to Warner Bros. Movie World. No, if this is your first time to Gold Coast, you can't finish exploring both in a day. Different story if you are single, but if you have kids, best bet is to dedicate one day for each. Good news is that the park remains open all year with all of the pools and slides heated during the winter months. 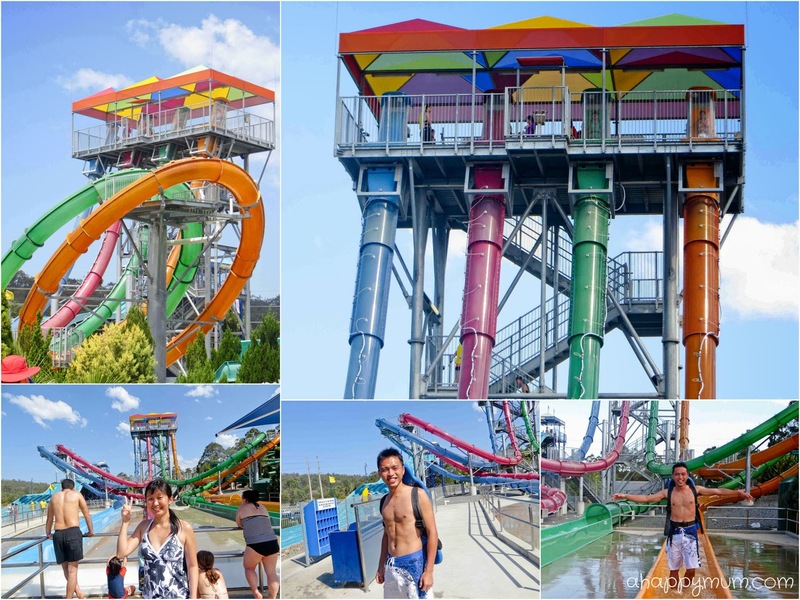 Being my second visit to Wet N Wild, I remembered my friends and I did have some pretty wild and wet moments here when we went on some thrill rides including the Blackhole where riders are immersed in complete darkness, the Tornado which dips down, turns before speeding a steep drop into a funnel, and the Super 8 Aqua Racer, a racer slide where eight friends get to race headfirst down an 86-metre long track. 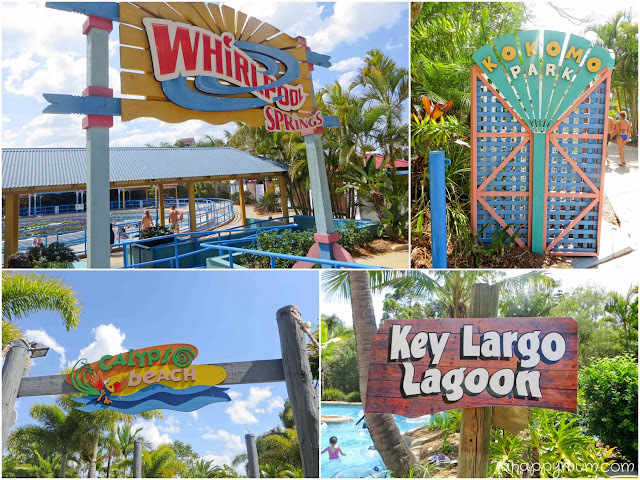 This time, we stayed in the more kid-friendly areas including the Buccaneer Bay - a pirate themed children's play area, and Calypso Beach - a large lazy river attraction where you can find real sand all around. Unlike some of the water parks we have been to, the staff here was really strict when they said no adults are allowed on the slides in the children's area. It didn't matter that I had a baby who couldn't possibly slide on her own, or that I had a preschooler who was scared to go down and needed a confidence boost, no means no so eventually we had to give up on the slides. So we spent a good part of the day just lazing in the river or splashing about in shallow waters and you will be surprised by how that could entertain them for hours. We had also brought along Kentucky Fried Chicken for lunch and when I sneaked off to try out a thrill ride, I came back to discover that even my baby was happily munching on KFC. 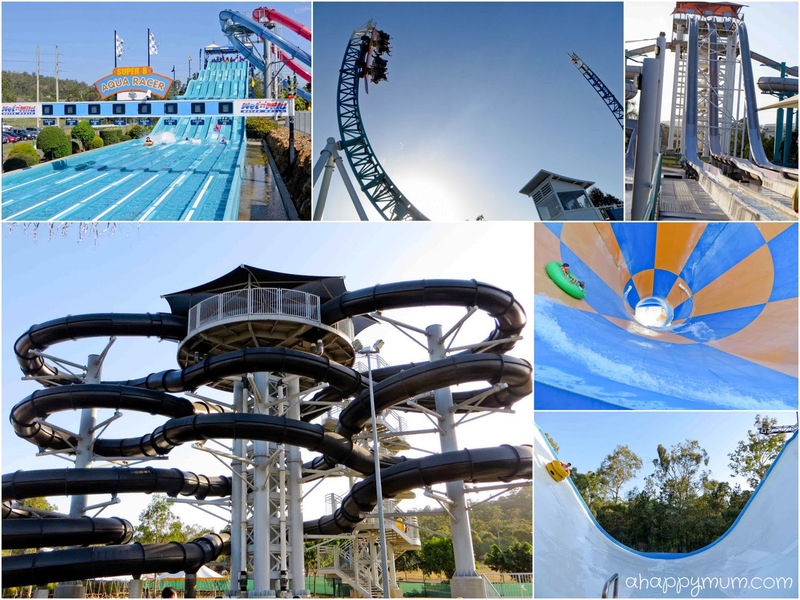 Now, for the highlight of the day for the hubby and I - the AquaLoop, which consists of four looping body slides featuring a trap door release with 2.5G acceleration. The first ride of its type in Australia, riders have to wear a board on their backs, then they are dropped into a vertical slide and an inclined loop, reaching a top speed of 60 kilometres per hour. For this ride, you must be between 40kg and 130kg and at least 120cm tall. There is also a signboard that says "Do not panic" and tells you what to do if in the event that you don't make it up the loop and get stuck halfway. How assuring. Remember I said I screamed like a mad woman in Batman Spaceshot? Well, this was double the pitch and triple the volume. I shrieked all the way, even when water was splashing on my face, till the moment I emerged at the bottom that I got up and pretended to walk away calmly. But since there was only a big-sized guy who rode simultaneously with me, it wasn't that hard for onlookers to decipher where the mad screams came from. Sounds ironic, but I loved that feeling of thrill, you know what I mean? 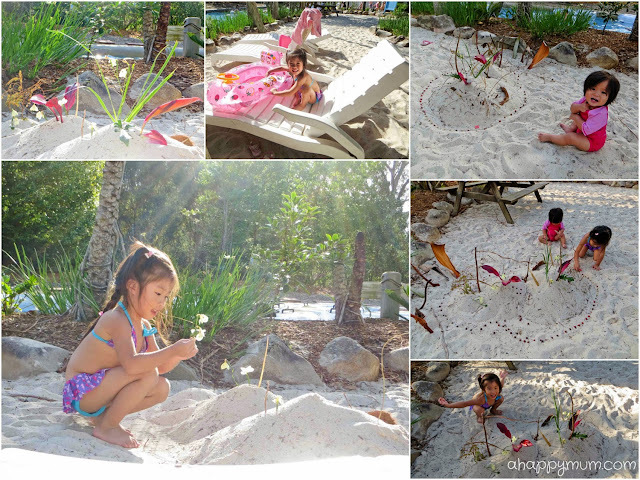 Our last part of the day was spent building sandcastles at Calypso Beach. Which, by the way, happened to be Angel's happiest part of the day. Together with the dad, she built castle after castle, or rather, hill after hill, and even found some pretty flowers, seeds and embellishments for her creations. Voila! Pretty, right? It was then I realised that coming to a theme park doesn't mean we have to rush against time to try out every possible ride or watch as many shows as we can. 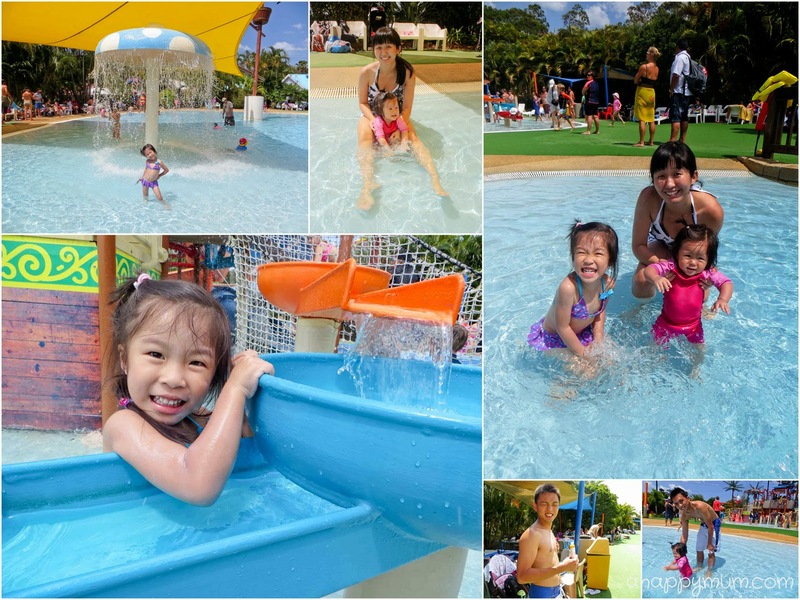 Instead, it is about taking time off to relax, to smile and have fun, to explore bit by bit, to enjoy the bonding as a family. Whatever happens, even if things go against your will, remember to laugh it off and be happy. Because that is what a family holiday is all about. Thank you, Gold Coast Australia, for all the awesome memories you gave us! 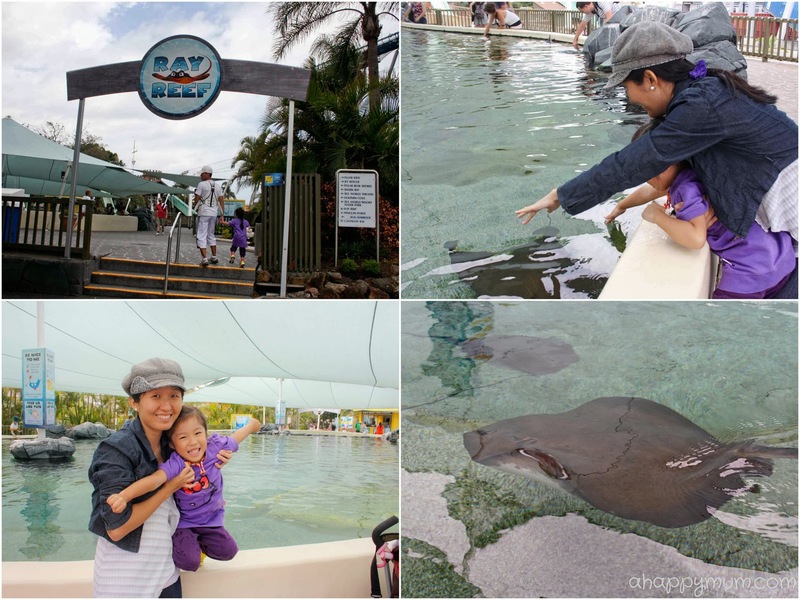 This is Part III of our holiday in Gold Coast in Queensland, Australia. 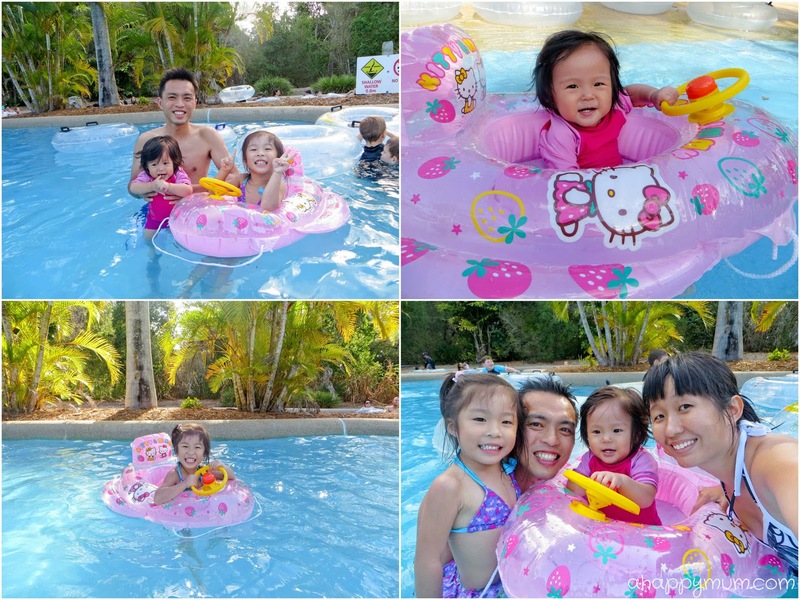 Part I talks about our experience at Lillydale Farmstay and Part II about Broadwater, parks and beaches. Disclosure: We received complimentary VIP tickets to the above theme parks from Village Roadshow Theme Parks in writing this post. No monetary compensation was received and all opinions are our own. Also, i love the dolphins shots!!! Haha, was i the camera man?? I think so, haha, but we have about the same skills (or no skills) anyway. i love the shots too! Thanks! for the post . Just fun loving images of the jumping castle and the kids are also adorable. Wat camera do u use? ?